One Time, Tax-Deductible Donation: Use the link on the right to donate now. 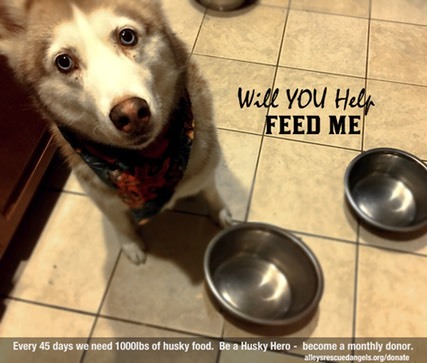 Every donation can make a difference to our rescued huskies. Perhaps you would consider a $150 donation to sponsor our food bill for a week! Monthly Tax-Deductible Donor: Monthly giving is an easy, efficient and tax-deductible way to make a difference for dogs all year long. Monthly gifts provide a consistent, reliable donation stream that allows us to spend less time worrying about the vet bills and more time saving lives. Checks: Made payable to ARA Canine Rescue Inc. Your donation allows us to continue our rescue work and help save the lives of animals in need. ARA Canine Rescue Inc is truly a labor of love and we cannot accomplish the things that we do without your help. Your donations are tax deductible. **Holiday Gift Certificates: A gift for the huskies and a gift for you. During the Holiday Season we offer GIFT CERTIFICATES for anyone that would like to purchase a symbolic gift for friends and family. Donate via our website and you can download the gift certificate immediately. These gift certificates can be printed here so you can wrap it and put it under the tree. This charitable gesture is an awesome way to support ARA this gift giving season and your philanthropic friends will be happy that their gift has helped save a huskies life.